The Cessna Citation Bravo, replacement of the Citation II and the Citation S/II, is equipped with the largest baggage capacity in its class. The Bravo features a Honeywell Primus EFIS avionics suite and an improved interior, based on the one first introduced in the Citation Ultra and capable of safely transporting seven passengers. The Cessna Citation Bravo was introduced in 1995 as the next iteration in Cessna’s Citation line. With short runway capabilities and sufficient efficiency to fly for an impressive 1,700 nautical miles, it is easy to see why this private jet quickly gained repute in the industry. Featuring updated engines, a glass cockpit, and smoother-riding landing gear, the Citation Bravo offered several notable updates. Such updates also include an added step and a wider air stair tread to ease the boarding process. With higher efficiency and lower operating cost than its predecessors and many other light size private jets, the Cessna Citation Bravo proves a viable candidate to meet your business needs. After being certified in 1996, over 330 Cessna Citation Bravos were manufactured before production ended in late 2006. 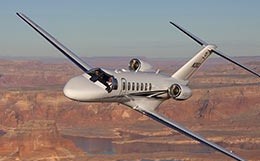 During this production window, over 330 Citation Bravo aircraft were delivered. 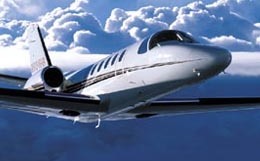 Production on the Citation Bravo started in 1994 and ended in 2006. 330 aircraft have been built so far. 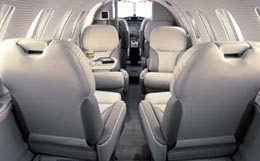 The engineering behind the cabin of the Citation Bravo was geared for the comfort of the client. This shines through in the quiet cabin design, which eliminates low-frequency engine fan noise by utilizing an isolated interior shell coupled with a secondary seal for the cabin door. With just over 73 cubic feet of baggage capacity, a storage compartment by the lavatory, and additional storage in the form of drawers beneath the seats, there is more than enough space for all of your carry on needs. The Citation Bravo utilizes engine bleed air for air condition, heating, and pressurization. With a pressurization differential of 8.8psi, the Citation Bravo allows for a comfortable environment. With a maximum operating altitude of 45,000 feet, the Citation Bravo is capable of flying comfortably above most aviation traffic. If speed is the main focus of your venture, this private jet has a maximum cruising speed of 404 knots. 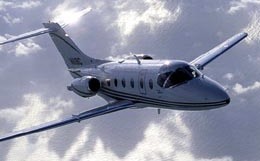 However, if distance is the goal of your trip, the Cessna Citation Bravo is capable of flying at its long range cruise speed of 342 knots for a maximum range of up to 1,700 nautical miles. One of the most notable updates the Citation Bravo features is the incorporation of two Pratt and Whitney PW530A turbofan engines. These updated engines allow for the improved range and increased efficiency that this private jet features. The Cessna Citation Bravo utilized trailing link type landing gear, which more evenly distributes the loads of taxiing over rough surfaces and yields a smoother ride for both taxi and landing. The Citation Bravo comes equipped with a Honeywell Primus 1000 integrated avionics system, which includes a Honeywell GNSX flight management system as well as an electronic flight information system. This avionics system utilized two 7 in. by 8 in. displays, one being a Primary Flight Display and the other being a Multi-Function Display. The navigation included in this impressive technological suite includes distance measuring equipment, a VHF omni-directional ranger, a C-14 compass set, digital automatic direction finder, Honeywell Primus 660 color weather radar, and Honeywell VG-14A vertical gyroscopes. This avionics system is preferred by pilots not just for its ease of use, but also for its safety factor. For more information about chartering, leasing or buying a Citation Bravo please contact us by calling +44-20-3874-8091 or send us an email here.